Telephone AC300 (shown right) was previously numbered the 381. This set was made from 1901 which was the Ericsson company's 25th year. 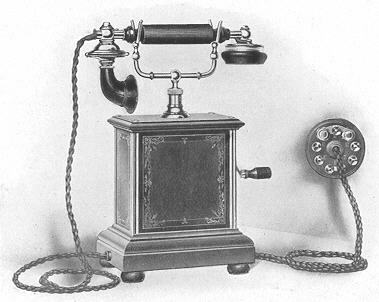 The phone is called the jubilee set and is more ornate then other sets from this period. Telephone AC310 had a 4 magnet generator and was previously numbered the model 383. Telephone AC320 is similar to the AC310 except that it had a ringer resistance of 1000 ohms, 4 magnet generator and a press button for cutting out the ringer coils and short circuiting the induction coil. This button was pressed down whilst ringing out.